BRACEBRIDGE — Last Friday, on his 96th birthday, Liam Dwyer bought a round for residents in the bar in the new addition at the Castle Peak retirement home here. Tomorrow, the residents will be toasting his memory after a funeral Friday morning at St. Joseph’s Catholic Church. Dwyer died in hospital Tuesday. 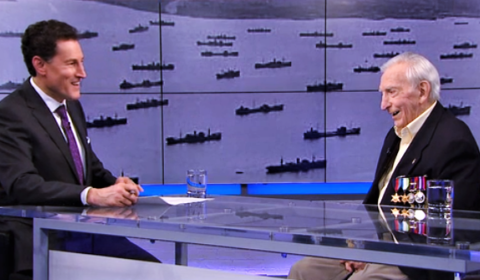 Steve Paikin interviewed Liam Dwyer March 18 for a show called Defending Canadian Shores. “He’ll sure be missed around here,” said Edith White, a fellow resident, longtime friend and co-author with Eve Jones of the residents’ book At Your Age. Just last month Dwyer ordered another 100 copies of the book, which has sold more than 1,500 copies and raised some $20,000 for charity. At Your Age is a compilation of 52 stories by residents about their lives. Dwyer wrote six, himself, and in a recent interview he said 14 of the writers had died. Dwyer was a prolific storyteller and writer. His series of murder mysteries, Murdoch in Muskoka, were also very popular, said Sarah MacDonald, of the Veranda bookstore, in Bracebridge, which sold both the residents books and his series. Dwyer’s son Jim, and his wife Lori, owned Scott’s Book Store for many years. Lori said Liam was “the star of the party” on his birthday, when the family gathered to celebrate last Friday. Then he went into hospital Saturday. Liam Dwyer’s Murdoch in Muskoka murder mysteries were very popular with summer readers, along with the book At Your Age, all still available at the Veranda book store in Bracebridge. She said he had been in such great spirits since returning from a visit to Comox in the fall to visit is his son Greg. His other son, Joseph, lives in Mississippi. Both are here now for the funeral. Dwyer had recently appeared on The Agenda, March 18, with Steve Paikin for the first of two tapings of the TVO show. Defending Canadian Shores saw Dwyer talking about his time in the Royal Canadian Navy protecting Canada’s shores from the Nazi subs the came into the St. Lawrence River, a heroic sea rescue of sailors on the Esquimalt, and his time working on the Avro Arrow. Dwyer told Paikin he was the one who took “seven truckloads” of blueprints to the dump for disposal after the Avro was cancelled. He said he didn’t blame prime minister John Diefenbaker for the decision; he blamed the people who advised him and said they should have known better. It was a very interesting, lively and informative conversation. The second taping was about Dwyer’s life aging, which was another topic he was involved in. That show has yet to air. Dwyer, Liam Desmond died peacefully at South Muskoka Memorial Hospital, in Bracebridge on Tuesday, April 09, 2019 in his 97th year. He was predeceased by his wife of 74 years, Mary Carol Dwyer in 2018. Much loved father of Jim (Lori), Gregory (Debera) and Joseph (Janna). Loving grandfather of Christopher, Katie and Vickie and great-grandfather of Liam, Aine, Finn, Jaiden and Tyler. Many thanks to the wonderful caring staff at Castle Peak Retirement Home. Visitation will be held at Reynolds Funeral Home on Friday April 12, 2019 from 10:00 a.m. to 11:30 a.m. The funeral mass will be held at St. Joseph’s Roman Catholic Church in Bracebridge on Friday April 12, 2019 at 12 noon. Reception will follow the funeral mass in the church hall. A family interment service will be held later in the spring at Mickle Memorial Cemetery in Gravenhurst. As your expressions of sympathy, memorial donations may be made to Hospice Muskoka. Messages of condolence for the family may be made at www.reynoldsfuneral.com.